On International Women’s Day in Pakistan last month, thousands of exuberant young feminists staged their second Aurat (women’s) March. Intended to build on the success of a well-received march last year, it was designed to be inclusive, peaceful and raucously joyful. It had women from all walks of life, some in Western clothes, others in full veils, headscarves and burqas. Women from cities and villages. Female health workers and teachers. Trans women and male allies. Recalling the joys of the 2018 march, the activists and volunteers had gone to low-income neighbourhoods and rallied women there. They bused women from rural villages. They printed flyers with artwork by young female artists, and drew posters that expressed their frustration, anger, hope and courage. On March 9, perhaps 6,000 women marched peacefully in Karachi, and another 3,000 in Lahore. Smaller groups walked in smaller locales: Peshawar, Quetta, Hyderabad, Faisalabad and Chitral. The marchers made headlines all across Pakistan. Still, the march organisers had never envisioned a reaction of this type or magnitude. The models for protest were the old-guard feminists who, 40 years ago, protested against president Gen. Mohammad Zia ul Haq. So the march put out a manifesto of demands: no more honour killings; living wages for female domestic workers, factory workers and agricultural labourers; equal access for females to education and professional opportunities; and laws to protect women and transgender people. As soon as the march was over, posts on Twitter and Facebook said it had been organised by and for privileged urban upper-class women only — a familiar tactic to undermine feminists’ solidarity with working women in cities and members of the rural under classes. The critics ignored the demands, and zeroed in on a handful of mildly explicit placards captured by the media. Refusing to accept the posters as sly humour, the critics accused the marchers of obscenity and vulgarity — another familiar objection that raises its head whenever Pakistani women demand their rights. The march organisers have now entered talks with Pakistan’s Federal Investigations Agency to identify and prosecute the users of some 22 social media accounts that the marchers say have violated a law against posting hateful threats. But nobody in the government has expressed support for the organisers of the march, except for a vague tweet from one of the federal cabinet’s three female ministers that threats of violence are unacceptable. Many Pakistanis admit that women face huge obstacles, and that improving their status would help move the entire nation out of poverty and away from injustice. But critics argue that women seeking too much freedom “in the wrong way” violate the limitations of Islam, Pakistani culture and society. Instead, they say, women should be more “mature and balanced,” when asking for their rights. In short, they should accept whatever is granted to them, conditional on their good behaviour, by Pakistani men. 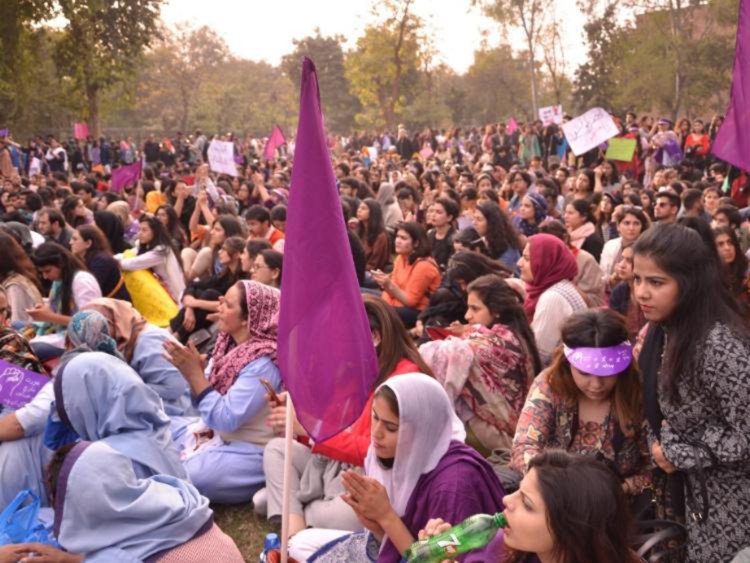 The rise of the women’s movement, in which women are growing aware of their rights and mobilising to pursue them, indicates a seminal moment in Pakistani history — the beginning of a cultural shift in the younger generation’s attitudes toward women and their role in modern Pakistani society. Sixty-five per cent of the population is under 30, and younger Pakistanis are more idealistic and hungry for change. Bina Shah is a Pakistani writer, columnist and blogger living in Karachi.